In the mid-19th century, wealthy Americans, anxious to avoid the heat of the cities, began to come to Newport to enjoy some time by the seaside. As these visits became a regular part of their year, they began to build “cottages” where they could spend their time in Newport. Over time, these cottages evolved into mansions designed by the foremost architects of the day as well as decorated and furnished in the most lavish style. While they were only occupied for a few weeks each year, the elite of American society built them so as to display their wealth and prominence. A substantial number of the Newport mansions have been preserved and are open to the public. They attract thousands of visitors each year not only because of their impressive architecture and the artistic quality of their contents but because they offer a glimpse into an extraordinary way of life that evaporated during the 20th century. Cruise ships calling in Newport invariably offer one or more shore excursions to the mansions. Several local companies also offer tours. However, passengers can visit the mansions independently. The Yellow Line (#67) of the Rhode Island Public Transit Authority goes from the Newport Visitor Center to Bellevue Avenue where most of the mansions are clustered. In addition, if you are a strong walker and the weather is nice, it is not difficult to walk from the tender pier to Bellevue Avenue. 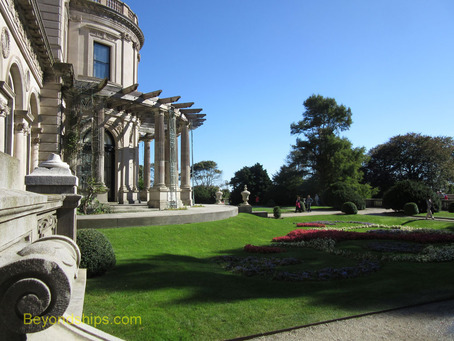 Once you are there, The Preservation Society of Newport County, which operates most of the mansions that are open to the public, offers a variety of tours of its properties. These include self-guided audio tours of some of the most popular mansions as well as specialized tours such as a tour that looks at life at The Elms from the servant's perspective. Personal and group tours with guides can also be arranged. Admission tickets can be purchased online or at the mansions themselves. Not every mansion is open every day, so it is worthwhile to check the schedule online beforehand. 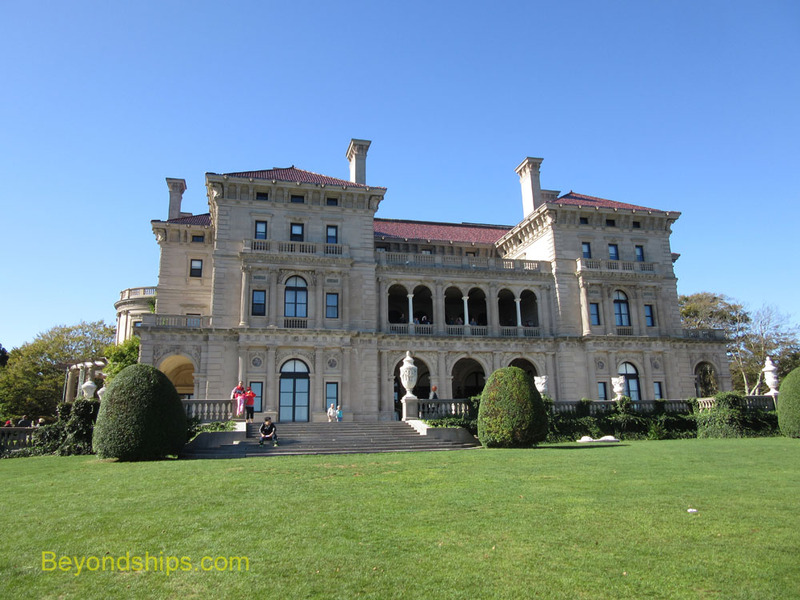 This article describes only a sampling of the Newport mansions. The monarch of the Newport mansions. The Breakers is big, ornate and fascinating. In the first half of the 19th century, Cornelius Vanderbilt became very rich through shipping and railroads. These riches allowed the Commodore, as he was called, and his family to take a prominent place in the upper reaches of American society. In 1895, the Commodore's grandson, Cornelius Vanderbilt II, purchased a summer house called the Breakers in Newport overlooking the sea. However, a few years later, this wooden house burnt down. To replace the original house, Vanderbilt hired architect Richard Morris Hunt to design something more appropriate for one of America's leading families. The result was the 70 room mansion that we see today. Built in just two years, the price tag was $12 million dollars (about $335 million in today's dollars). The Breakers is an Italian Renaissance-style palazzo. Its interior is built around a great hall that rises some 45 feet high. The designers used marble imported from Italy and rare woods from Africa in creating the décor. In some cases, they took design elements from rooms in European palaces and chateaux. In other cases, the entire room was taken brought to America and reassembled in the Breakers. The resulting effect is impressive, which is what was intended. The Vanderbilts were "new money" and felt they had to prove that they belonged in the upper strata of society. Its overwhelming opulence confides that the people who live here are not only rich but powerful. What you see at the Breakers is not a re-creation. The widow of Cornelius Vanderbilt II left the Breakers to her youngest daughter Gladys. She was an ardent supporter of the Preservation Society and in 1948, she opened the Breakers to the public with the proviso that the family would continue to have exclusive access to the thrid floor. Although the Society purchased the property in 1972, the living arrangement continues to this day. As a result, the contents that you see are the family's. 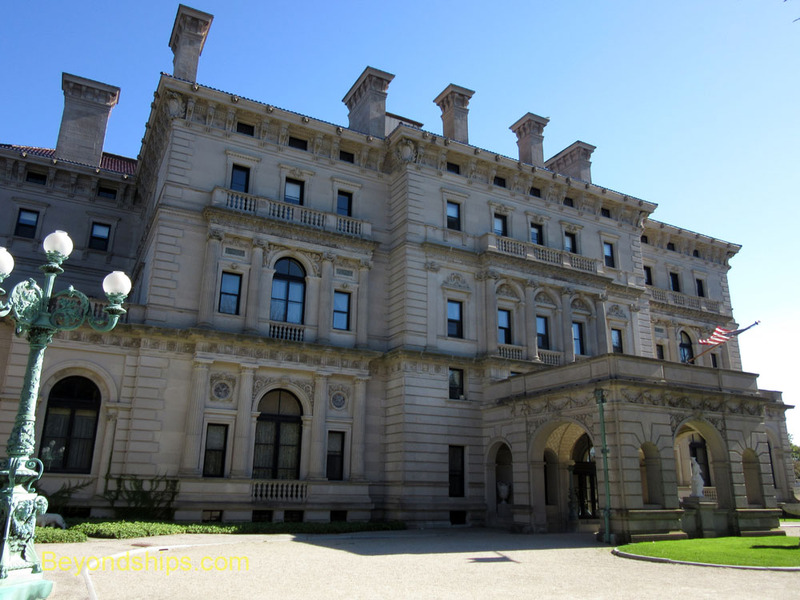 A National Historic Landmark, The Breakers attracts some 300,000 visitors each year. The exterior can also be seen from the Cliff Walk, a public path that follows the shoreline.